Probably won’t stop it, but hey, let ’em try. Amazon’s swallowing of Whole Foods understandably has supermarket chains and meal-kit companies alike sweating bullets, but even if they were dead set on blowing up the merger, they really couldn’t; a full derailment would require either angry shareholders (who still have to officially approve it) or a frightened government (which could block it over monopoly fears or other concerns). Luckily for Amazon’s rivals, both are making noise about the deal. Hailing from the first group is Whole Foods shareholder Robert Riegel, who, per the Austin American-Statesman, has just filed a class-action lawsuit in Texas alleging that the deal is “misleading” and the company “failed to disclose information important to stakeholders.” He believes Amazon’s $42-a-share offer is a slap in the face that, worse, was shrouded in secrecy. It’s true that negotiations were in Amazon’s favor; there were six other potential buyers, including a “Company X” believed to be Albertsons, but Amazon threatened to walk if so much as a “leak or rumor” of its interest broke. (This could’ve set off a bidding war.) Riegel doesn’t like that cornering, plus he argues that Amazon owes shareholders a clearer picture of its plans “regarding the future employment” of Whole Foods’ executives. He’s asking the court to stop the merger entirely. Amazon’s proposed acquisition of Whole Foods raises important questions concerning competition policy, such as how the transaction will affect the future of retail grocery stores, whether platform dominance impedes innovation, and if the antitrust laws are working effectively to ensure economic opportunity, choice, and low prices for American families. The Department of Justice and Federal Trade Commission will also get a chance to object, though experts don’t see much reason why they would. 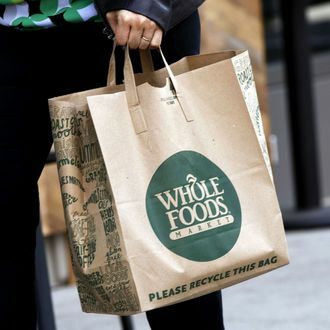 Whatever the case, Amazon and Whole Foods say the deal could be sealed by end of year, so opponents better hope this bluster amounts to something sooner rather than later.